If you have Nest thermostat, you know it’s a great gadget that helps you save money maintain the perfect temperature in your home. However, just like all technology, sometimes things go wrong and your thermostat can stop working properly. In many cases, you can pinpoint and fix the issue on your own. Here are four common things to look for if your Nest display won’t turn on. A red blinking light means that the Nest’s battery is running low. It should turn back on automatically after the battery is charged. You can also speed up the process by disconnecting the thermostat display and plugging it into the USB port that came with your device. Once the Nest is recharged, reconnect the display by pressing it firmly onto the base until you hear it click into place. If a green blinking light suddenly appears, it just means that your Nest is automatically updating its software. During this process, the display will restart, which usually only takes 1-2 minutes. If it takes much longer time, check to make sure the display is correctly connected to the thermostat base. In rare cases, you may need to manually restart the Nest by holding down the display for 10 seconds, then releasing it. Here’s more information on restarting your Nest. If you don’t see any blinking lights and the Nest refuses to turn on, usually this means that the battery is completely drained. Make sure the display is properly connected to the base so the battery can recharge. You can do this by removing the display, checking to make sure there isn’t anything blocking the connection, then pressing the display back onto the base until you hear it click into place. If a red light starts blinking on the display, that means the battery is charging and you just have to wait until it has enough power to turn back on. Make sure the wiring is properly connected. Remember to turn off the power to your system before removing the thermostat to examine the wiring. Make sure that your electrical system is compatible with Nest. Incompatible systems can damage the thermostat. 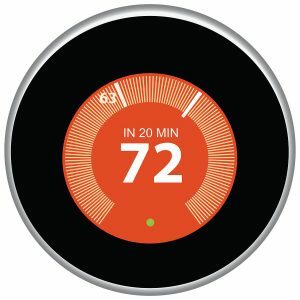 This means your Nest detected a problem with the thermostat’s wiring or internet connection. To determine the exact issue, you’ll need to look up the error code and troubleshooting instructions for your Nest model. Hopefully, this article helps you identify and fix the problem with your Nest. Of course, if you have any questions about your thermostat or heating system, call the friendly team at Robert B. Payne, Inc. at (540) 373-5876. We’re always happy to help.